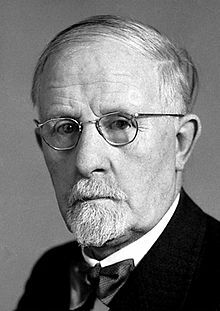 Walter Rudolf Hess was born on March 17, 1881 in Frauenfeld in the Swiss canton of Thurgau. He was the second of three children on Clemens and Gertrude Hess. His father was a physics teacher in a grammar school and ran a weather station. Hess learned physics from his father and helped the family electrify the family's apartment. He began studying medicine in Lausanne in 1899, finishing his studies in Berlin, Kiel, and Zurich. After passing his qualifying medical exam in Zurich, in 1906, he served as a surgeon's assistant. While a surgeon's assistant he developed a device to measure blood viscosity that was widely used clinically but has been replaced by the measurement of blood sedimentation rate. He was later an ophthalmologists's assistant and then an ophthalmologist. Hess's interest was in physiology and in 1912 he gave up a prosperous practice to take the position of a physiologist's assistant, working under Justus Gaule. In 1916, with Gaule's retirement, Hess first became interim director and then director and professor of the Department of Physiological Institute at the University of Zurich. He remained there until his retirement in 1951. Hess's physiological studies included the circulatory system, but he is most remembered for his research into brain function. Using a fine tipped electrode he was able to stimulate regions of the mid-brain and develop a map of its functions. Mammalian brains are largely divided three regions: the hindbrain, the midbrain, and the forebrain, moving up from the spinal cord to the head (for a diagram of the brain showing some of the functions of different regions see here). Different regions of the brain have different functions with the hind brain, or brain stem, having body maintenance functions including body temperature, heart and breathing control. The forebrain includes the four lobes of the cerebellum which control thought, memory, and movement. Hess, using his electrode to stimulate regions of the hypothalamus, a region of the mid brain, found that he could stimulate excitement or apathy. He also found regions where he could stimulate hunger and thirst. For his researches he was awarded the 1949 Nobel Prize in medicine and physiology "for his discovery of the functional organization of the interbrain as a coordinator of the activities of the internal organs." Other honors won by Hess include the Marcel Benoist Prize in 1932 and honorary doctorates from the Universities of Bern, Geneva, and Freiburg and from McGill University. He died on August 12, 1973.